“We’ve turned a corner, but we’re still not doing enough,” say front-line workers . Days after Toronto’s second legal supervised injection site at the South Riverdale Community Health Centre won federal approval, a heated trailer arrived in Moss Park, enabling the site to continue operating through the winter. That trailer, donated by CUPE, will assist an illegal overdose prevention site in Moss Park, where professional medical staff, harm reduction workers and drug users oversee injecting, snorting and smoking. The two events highlight how opening safe injection sites in Ontario is too difficult and that means more people will die, according to some front line workers in the fentanyl crisis. Matt Johnson, a harm reduction worker at the Queen West Community Health Centre said he wants a system where overdose prevention sites are encouraged rather than aspired to. “The process is more onerous than it needs to be. You don’t need a whole bunch of training or a bunch of staff, there are people who are already well qualified to do the work. You can do it out of an office the size of my office,” Johnson, whose office is not huge, said. Adding to the dissent on the provincial approval system was Nick Boyce, Director of the Ontario HIV and Substance Use Training Program. “I don’t know why there’s this process to begin with. It could be as simple as provincial or municipal governments instructing their local police forces, ‘in this particular area, if this particular agency is opening up a site, don’t go arresting people,” Boyce said. While drug overdose deaths related to fentanyl continue to climb in Toronto and throughout North America, getting a legal exemption for drug users to safely inject requires going through a particularly intensive application in Ontario. Between stipulations around public consultations and renovating entire wings of health centres, it’s harder to get an overdose prevention site approved in Ontario than in other provinces. Since August 12, nearly 100 overdoses have been reversed by a volunteer overdose prevention site in Moss Park, operating illegally and unfunded in tents. Police haven’t shut down the Moss Park site, either fearing a public backlash or because of good will, and the province has provided a heated tent. The Toronto Harm Reduction Alliance, who run the Moss Park site and where Johnson is a treasurer, sent an invoice to Queen’s Park billing for hours overseeing drug use and handing out naloxone kits. Johnson said he didn’t know if the Ontario government would end up paying the bill. Meanwhile, Toronto’s first permanent, legal supervised injection site opened at The Works Needle Exchange Program on November 8, near Yonge and Dundas Streets. The South Riverdale Community Health Centre is expected to open up a safe injection site as early as this week, and the Parkdale Queen West Community Health Centre’s site is scheduled to open in December. But Johnson said federal approval came for all three supervised injection sites back in March and is only opening up now because of unnecessary delays by the province. Hopkins said The Works will have five booths for users while the South Riverdale and Parkdale locations will each have four. The Fred Victor shelter down the street from Moss Park is also planning on opening its own legal safe injection site, but it’s unclear when that will happen. The Moss Park overdose prevention site run by the Toronto Harm Reduction Alliance was initially set up as a temporary site until Fred Victor was ready to open one. But that partnership appears to have collapsed because some drug users are banned from Fred Victor, and wouldn’t be able to access a safe injection site on the premises. For now, the unsanctioned outdoor site in Moss Park plans on operating whether or not Fred Victor opens a legal safe injection site. 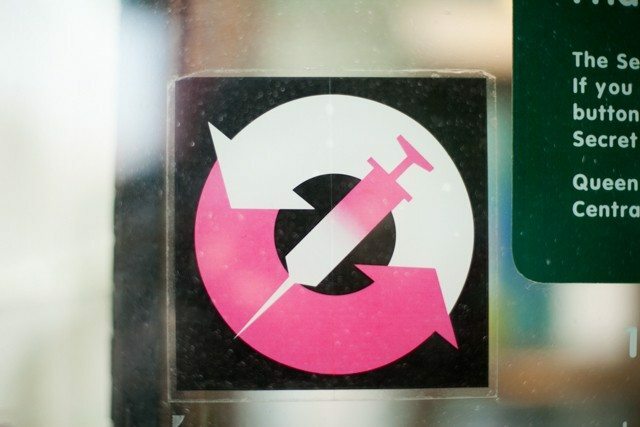 Though all three of the harm reduction workers Torontoist spoke with agreed opening legal safe injection sites in the city was progress, they also contended it wasn’t sufficient. Over at The Works, Hopkins said there was a long road ahead to even make the legal sites successful. “We are playing catch up. It feels right now like we can’t move fast enough,” Hopkins said.